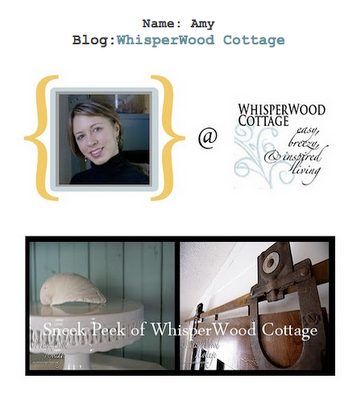 WhisperWood Cottage: Get Out the SYTYCD Vote! Get Out the SYTYCD Vote! The countdown is on! It all starts on Sunday! I'm getting ready for the big debut. I have to have my project ready by Friday. EEK! I've debated, wondered, stressed, and then just decided to be me, have fun, and not worry about the votes. Alchemy Junk, the host of So You Think You Can Decorate, has put together a great cast of competitors for this inaugural season. Check out all 10 of them on the "Meet the Decorators" page. Oooo - can't wait! Sounds like lots of fun and I'm sure there will be tons of inspiration - thanks for letting us know! I'm glad I wasn't the only one worrying and stressing about what to submit. It's nice that most of the women I'm competing with are my blog buds and I know it's truly a friendly competition. :) I can't wait to see what you've done. Good luck. I know that whatever you do will be SPECTACULAR!!! Excited to see all of them! I know you will do great and I am sure you will have my vote! I love your style!! I got me an old rotary phone and I've been exercising my index finger in preparation for voting! This the junker's olympics!!! What a neat thing to be involved in on here. Can't wait to see the results. Got my voter's registration card with me and I have been pumping iron to get my voting instrument in shape! Let's go! This is just soooo neat Amy! There are some really interesting decoraters! I'm with you all the way Sweetpea!!!! Good for you...just relax...and be AMY!!! That's why you are one of the TOP 10 that they wanted to debut this great idea!!!!! Delighted you are going to send reminders! What FUN this should be for you....and for us too! Can't wait!! Good luck with the deadline! So many of my favorite blogsters are participating, choosing a favorite will be difficult. And I am curious to see whether I can recognise which project is from who. Can't wait to see what you decide on for this first week. How very exciting!!! You will do great!! !